Software and Technical Consulting and Contracting services, using OSS and commercial solutions. Specialising in Front-end development, using a range of the latest and proven web technologies, coupled with best practices, to get projects out the door and onto desktops, tablets and mobile devices. Get in touch to discuss your projects, at whatever stage they're in, and see how we can help. 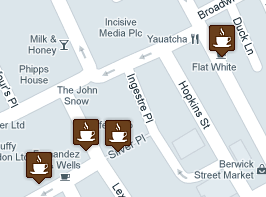 Esprso aims to help you find the best indie coffee places and beans wherever you are . An upcoming, joint project with Neil Noakes of Social Fabric, . On the UI side of things we use Bootstrap as a foundation, for maps (and geocoding) we use Google Maps, but we're testing Leaflet as a possible alternative. And the map icons are from a fantastic Map Icons collection by Nicolas Mollet. Currently hosted on Meteor.com's own hosting service, which provides the MongoDB datastore (by MongoHQ). An intentionally simple, two-pane editing app for online and offline use, which is being tested on upcoming browser-based operating systems, like Chrome OS and Firefox OS. HTML5 local storage for keeping what you're working on available offline and even when you restart your browser. App manifests were used to make Tandem installable on Chrome (more info) and Firefox OS (more info) - the Firefox OS Simulator was used for testing. 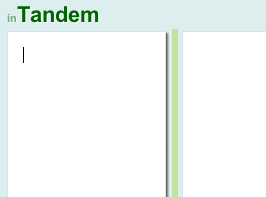 Tandem is available on the Chrome Web Store here. + jQuery, jQuery UI + jQuery UI Layout with jQuery UI Touch Punch for touch support. 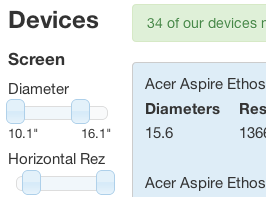 A prototype for browsing electronic devices by their attributes, like; screen size, brand, product and memory - but in this case on any kind of device, which means 10" tablets are showing up with 10" netbooks, for example. The quality of converged devices has reached a level where more and more of us are starting to consider having one device to replace two, a common example is the digital camera and the mobile phone. So to make our choices, we then start to weigh up how good a device is across multiple categories. And this is where Devices has begun to start experimenting. Devices is also using Meteor as the foundation, but in this case to experiment more with document datastores versus traditional RDBMS. + jQuery, jQuery UI (with jQuery UI Touch Punch) and Bootstrap.